Autumn is in full swing at our house. We’ve gone apple picking, bought some mums, decorated the Mantle and the Hoosier Cabinet, been baking up a storm…and now, making Scarecrow Cupcakes! Have fun decorating…frost the cupcakes and let the kids dig in! Looking for a new Fall Candle? I’m hosting an online Scentsy Candle Party. Be sure to head on over and link up to Delicious Dishes (Tues a.m.) on It’s A Blog Party, my other blog, where I host a different linky party everyday! How fun! I love how you made each one unique and different! Wow, these are perfect to make for Halloween kids party and it would be hit! 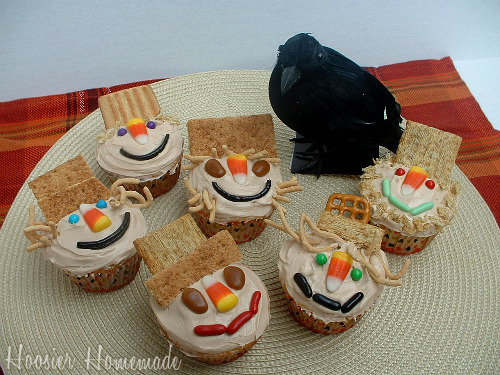 That Raven/crow next to cupcake is bit scary though! Thanks for including the video, it makes it much easy to follow. Those are adorable cupcakes, easy, fun, and inexpensive to decorate. I just love this, thanks for sharing. 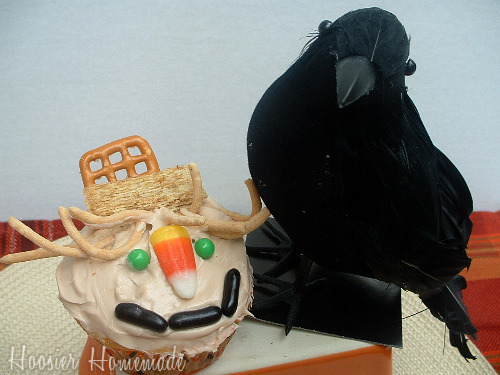 Love the cupcakes – where did you get the crow? I’d love to find one just like it!! So cute! You are so clever to come up with all of these ideas. Perfect for fall! These are super adorable 🙂 They are perfect for Fall…which is just around the corner! The crow is the perfect touch! These are adorable! These are so stinkin’ cute! Perfect for the fall!!! Awesome idea! I am bookmarking this page!!! OM GOSH THOSE ARE SO CUTE!!! @Lauren at KeepItSweet, Thanks so much Lauren, and thanks for visiting and leaving comments. I really appreciate it!